Why it matters: While it marches from industry to industry, Amazon has become a larger target with more dangerous enemies. "Any regulator that doesn't have one eye on Amazon is not doing their job," says Timothy Wu, author of "The Curse of Bigness." Critics say that while Amazon has offered cheap goods quickly delivered, it has also steamrollered business after business, and contributed to the national epidemic of relatively low, flat wages. Some say that the company should be broken up. On Black Friday and Cyber Monday, GMB, a union in the U.K., organized protests against Amazon's 24 warehouses in the country for dangerous working conditions as supervisors demand faster and faster work. Their slogan was "we are not robots." And Amazon workers in three other European countries — Italy, Germany and Spain — walked out as well. The labor unrest is in the U.S., too: In Minnesota, Somalian-born workers at an Amazon warehouse have entered negotiations with the company after protests of their working conditions, reports the NYT's Karen Weise. 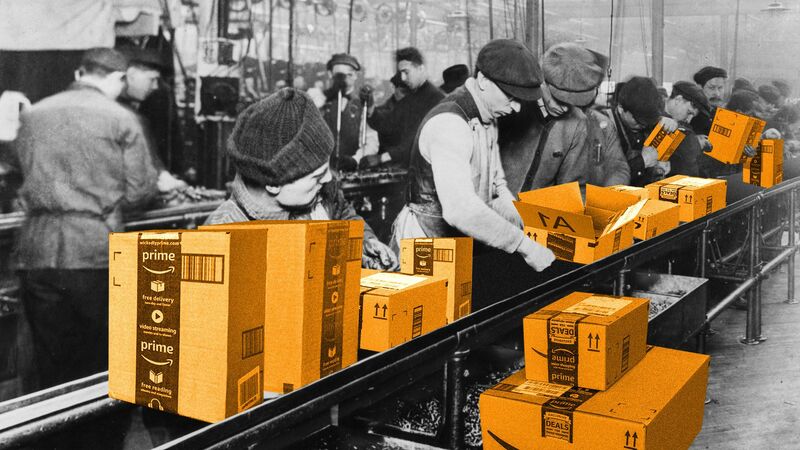 “Amazon has ended up becoming a flash point and a symbol for inequality in modern society,” Beth Gutelius of the Great Cities Institute at the University of Chicago, tells Axios.